Branding design and marketing materials for national recruitment agency. For over three decades Frontline Recruitment has been supplying recruitment services to commerce and industry, they provide the link between great candidates and great employers. 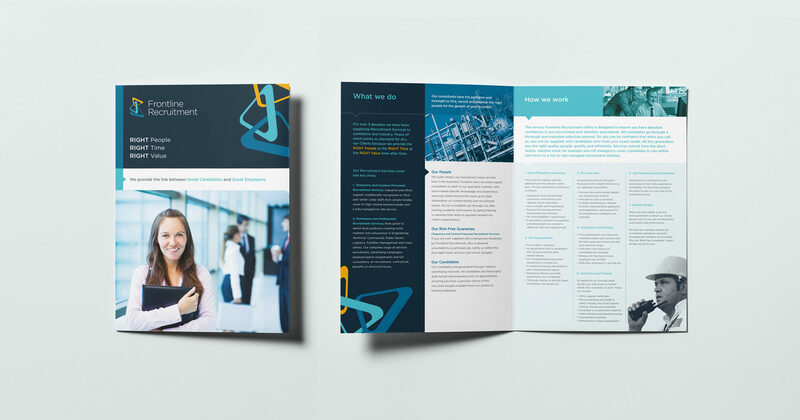 Frontline Recruitment approached us to overhaul and refresh their visual identity and improve their marketing and sales literature, making them stand out above their competitors, look more current and showcase their credentials more concisely to potential candidates and employees. This involved a new logo acccompanied by style guidelines, stationery and a printed and screen sales presentation pack.